What an honor to be invited to write a guest blog for the Daughters of the American Revolution! I’ve long been an admirer of the DAR for its work preserving the memory of the Revolution and encouraging people from all walks of life to learn about and uphold the lessons of the founding. And I loved taking my young daughter and her friends to the DAR Museum when I was on staff at Mount Vernon early in my career. We at the Museum of the American Revolution in Philadelphia are proud to be joining you in the important work of inspiring all Americans to understand the relevance of our nation’s founding. Creating a new, national institution is a daunting, but exciting undertaking. Fortunately, we assembled the key ingredients for success: a great collection of authentic artifacts, a location in the heart of historic Philadelphia, and a talented, committed team led by one of the nation’s great philanthropists, Gerry Lenfest, the chairman of our board. I’ve had the honor to lead the staff effort for the last 4-1/2 years, and during that time, we’ve been able to move the Museum from vision to reality—and are now on the threshold of opening. We will open without taking on any debt, but still must raise an additional $5 million to achieve our goal of securing the financial future of the Museum. We’ve just passed a major milestone: the completion of our state-of-the-art 118,000 square-foot building, designed by Robert A.M. Stern Architects. With its red brick and limestone materials and classical proportions, the building reflects and honors the rich history of our neighborhood. A large plaza embraces the Museum’s entrance, and extends our mission with a display of Revolutionary-era cannons, giant bronze bas reliefs of the famous paintings, The Declaration of Independence and Washington Crossing the Delaware, and a stone panel inscribed with inspiring words from the second paragraph Declaration of Independence. Now we’ve begun the frenetic activity of installing the centuries-old artifacts, cutting-edge technology, theater experiences, and immersive environments that make up our exhibits. When we open to the public on April 19, 2017, our visitors will be able to gather under Boston’s Liberty Tree; experience being on the front line of battle; or witness a historic debate among Oneida Indian elders that led to their joining the American cause. Our exhibits will explore the story of the Revolution from causes to conclusion, introducing visitors to the people from all walks of life who made it happen. 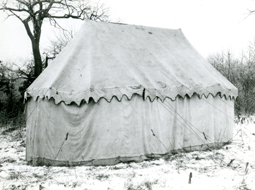 The crown jewel of our collection is George Washington’s Headquarters Tent, which served as both his office and his sleeping quarters when he was in the field. Washington’s tent tells the story of his inspiring leadership, unyielding determination, and steadfast devotion to his troops. Other artifacts range from a soldier’s wooden canteen branded with “UStates” at a time when the phrase was merely an aspiration, to British, French, Hessian, and American weapons and equipment, to the first newspaper printing of the Declaration of Independence. And, thanks to a generous gift from the DAR, in February we will hang a magnificent, full-scale 19th century copy of Louis Charles-Auguste Couder’s painting, Siege of Yorktown (1781) in the Museum’s second floor court. As our opening date rapidly approaches, we invite you to join us on this exciting journey. 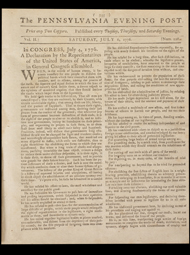 Sign up for our free Read the Revolution newsletter, which every two weeks provides an excerpt from a thought-provoking book about the American Revolution (and occasional updates on the Museum). You can also follow our progress on Facebook, Twitter and Instagram. And plan a visit now!—we are already accepting reservations from groups, with discounted admission. 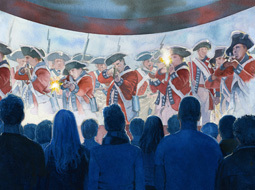 On April 19, 1775, the opening shots of the Revolutionary War were fired, changing the course of history forever. When the Museum opens on April 19, 2017 – the 242nd anniversary of the “shot heard ‘round the world” – we hope you will join us in making history once again! Groups of 15 or more receive discounted admission. 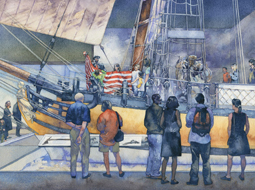 Reservations can be made by contacting the Group Sales Department at 267.858.3308 or Groups@AmRevMuseum.org. Groups also have the opportunity to add a special program led by one of the Museum’s experts. Classrooms and conference rooms are available at the Museum as meeting spaces or for a private lunch by the Museum’s exclusive caterer, Brûlée Catering. Individual tickets to the Museum will be available for purchase in February 2017. #TBT 125 years ago, on April 19, 1894, the Sequoia Chapter in San Francisco, California, planted a �... 20 hours 8 min ago.